As organizers, we help people maximize their spaces to make them more functional. Most of the time the solutions are relatively simple but every once in a while we need to get a little creative to find a way to really maximize a small or odd shaped space. Sometimes this means finding that one unique organizing product that is a perfect fit and other times it is finding a favorite product from one area of the home and repurposing it for another. Below are some of our favorite recent storage hacks that repurpose products all across the home. Happy Organizing! Need to store wrapping paper so that won't take up valuable floor space? Try using this plastic bag dispenser from Ikea to hold wrapping paper rolls in a closet. Just affix it to the wall and you are ready to start wrapping. 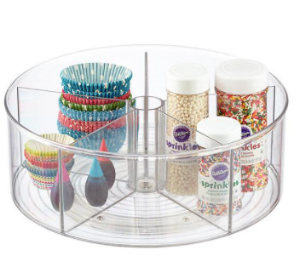 Consider using this divided Lazy Susan intended for the kitchen in any room of the house such as the bathroom, craft room or even the basement. This workhorse piece can easily store - and make accessible - anything from toiletries and hair products to paints and markers. Repurpose these larger adhesive organizing bins for the kitchen in your bathroom or other small space to keep counters clear and space maximized. Beautify your laundry room by removing laundry pods or even laundry powder from the packaging and putting it in one of these glass jars instead. Or if you are a user of liquid detergent and so inclined, you could even consider decanting the liquid into a glass drink dispenser. No place to store your tin foil and plastic wraps? 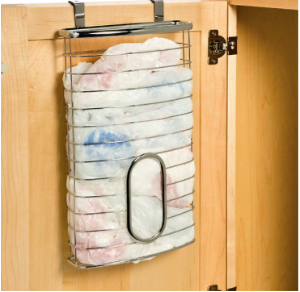 Use this over-the-cabinet grocery bag holder to fit three of your wraps instead and save drawer space for other items. What storage hacks have you used around the home? For more storage hacks, check out our beauty storage hack store here.